This vase is in <i>shottai-jippo</i> (a technique whereby the metal body is dissolved after firing) together with applied chrome-plated rims and base-plates. The leaves are formed through both <i>yusen</i> (with wires) and <i>shosen</i> (few wires) techniques. These two shotai-jippo vases have applied chrome-plated rims and base plates. 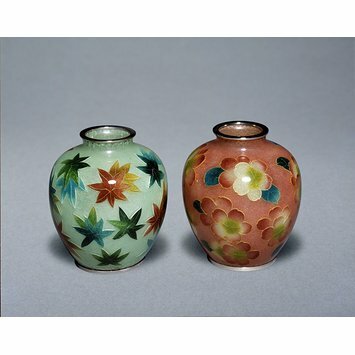 The left-hand vase has a silver yusen and shosen design of maple leaves (momiji) in shaded red and green enamels on a translucent green enamel ground. 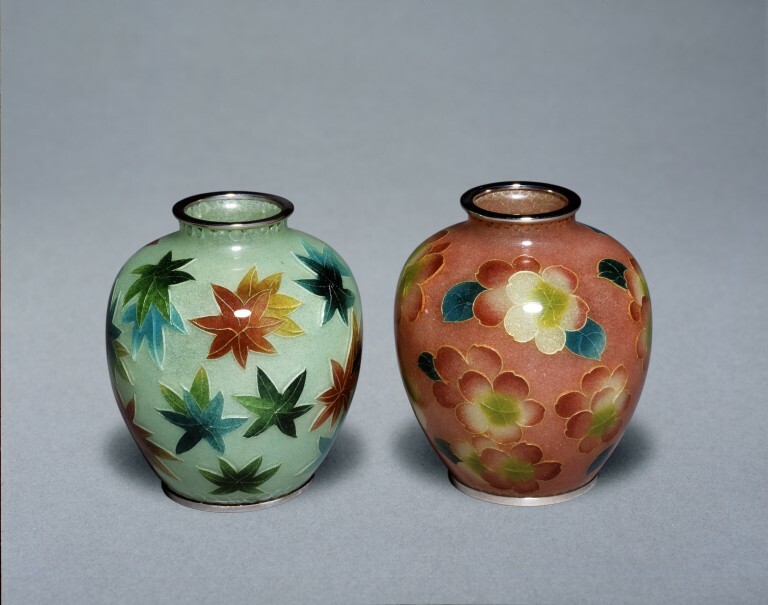 The right-hand vase has a silver yusen and shosen design of cherry-blossom (sakura) in shades of pink, yellow and green enamels on a translucent pink enamel ground. Both vases have silver yusen geometric patterns around their rims and bases. As a pair, they bring to mind the changing of the seasons, momiji and sakura being the classic signifiers, respectively, of autumn and spring. Very similar pieces were still being produced in Nagoya and sold through the Inaba Company of Kyoto until the late 1990s (and illustrated in brochures of that period). Cloisonné enamel bowl decorated with maple leaves, in shottai-jippo (a technique whereby the metal body is dissolved after firing) together with applied chrome-plated rims and base-plates. This vase is in shottai-jippo (a technique whereby the metal body is dissolved after firing) together with applied chrome-plated rims and base-plates. The leaves are formed through both yusen (with wires) and shosen (few wires) techniques. Cloisonné enamel bowl decorated with maple leaves, unsigned, Nagoya, Japan, c.1926-89. Irvine, Gregory. Japanese Cloisonné Enamels. (London: V&A Publishing, 2011). pl. 50.